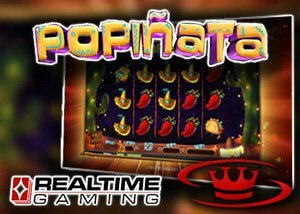 Real Time Gaming is set to release another new slot this April; the latest addition is titled Popinata and offers 5 reels of bright energetic fun. Slated for the 21st of the month, this piñata-themed slot will certainly appeal to those who enjoy a vibrant video slot filled with exciting features. The new Popinata slot release is a 5 reel slot that offers an abundance of popular features. Joining this Mexican party are re-spins, stacked wilds and wild symbols. It has been created for mobile and desktop play and features symbols that one would come across at a Mexican street festival such as fireworks, sombreros, candy, and various piñatas. The exact date for release to RTG casinos has yet to be determined, but a select few are expected to see it joining their list of available RTG slots on the 19th. One casino anticipating its release is Le Bon Bonus Casino, a French language casino. It offers the full contingent of games offered by Real Time Gaming and is offering a $50 RTG no deposit bonus to play the new Popinata video slot. Complementing the no deposit bonus is a deposit bonus for new players to the casino. This is a 100% match bonus but with it allowing for up to a $900 bonus, it is one well worth grabbing this generous offer. Whether you are a fan of jackpot slots or prefer table games, Le Bon has exactly what you need for a fun-filled time playing casino games that are designed with classic high-quality RTG graphics. Licensed in Curacao, the casino has many deals waiting to be embraced such as loyalty points and weekly bonus offers. Register today and get ready to enjoy the new slot Popinata upon its release. This action packed slot takes RTG gaming to new levels with its vibrant colours, sounds and added animation, all in place to provide you with the experience you have come to expect from RTG casinos.